Tales from the Tent continues Jess Smith's story. Jess left school, and after a miserable spell working in a paper-mill, she abandoned the settled life and took to the roads once more. The old bus had gone, to be replaced by a caravan and campsites. Times were changing, and it was becoming harder and harder for travellers to make a living by doing the rounds of seasonal jobs like the berry-picking. Conscious that the old way of life was disappearing before her eyes, Jess stored up as much as she could gather from the rich folklore of the travellers' world. Now she retells some of the many stories and songs she heard by the campfire or at the tent's mouth. Interwoven with these tales is the story of Jess and her life on the road--her first loves, her friendships, her days at the hawking and berry-picking, the exploits of her lovable but infuriating family, the unforgettable characters she meets. 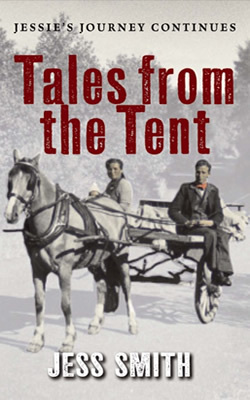 "Having thoroughly enjoyed Jessie's Journey, Tales from the Tent is another great read. Really feel you know Jess by now and it's a joy to share all the “tales” that she's heard over the years. Some certainly have you looking over your shoulder and others simply make you chuckle. Definitely leaves you wanting more yet with such a sadness that her travelling days came to an end. Another great insight by Jess into the ways of the travelling folk." "I can smell the smoke of the campfire and taste the sweet tea made from the waters of the gushing burn. Jessie really does make her words spring to life in your mind. A 'braw' book to 'courie doon' with and be taken on a journey in your mind. You won't want to come back."